In atonement to Donna for pulling a Gordon on her during the last round of Hay Hay it’s Donna Day, I thought I’d share a dish of hers that I really really like. It’s from issue 32 (the autumn 2007 issue…a season we don’t have here but that doesn’t stop me) of Donna Hay magazine, part of a feature on chorizo. Now, chorizo is something I love (along with a legion of other people I’m sure) and, unlike fresh figs, rhubarb, and chanterelle mushrooms, something that I can easily get here. Aside from being perfectly delicious on its own, it is also lends itself skillfully to many dishes, giving them a smoky kick and Spanish flavor. I can simply fry them up for cocktail nibbles; they are an essential element in my fabada; I’ve made fried rice out of them; and I’ve even used them in our ubiquitous munggo guisado (mung bean stew). – Place the beans on a baking dish, then pour the stock over them. 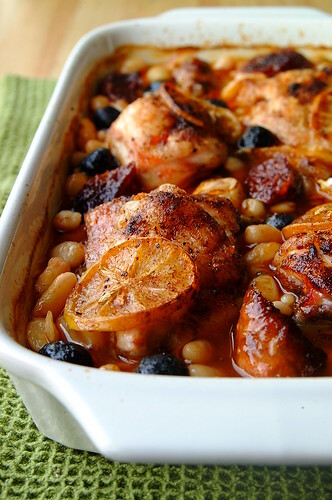 Arrange the chicken pieces, lemon, olives, chorizo, and garlic over the beans. Drizzle olive oil over the whole lot. Sprinkle with salt, pepper, and pimentón. 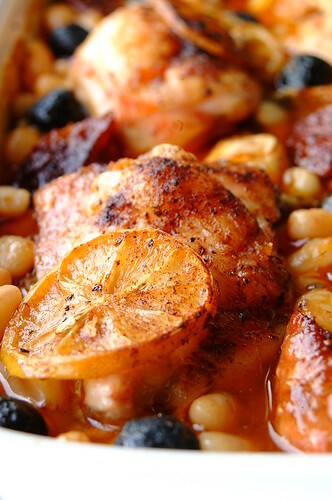 – Roast in a 200C oven for 45 minutes or until chicken is cooked through. Hi, I know you made this ages ago, but i was searching for the recipe everywhere! i have made it before (The Donna Hay version), but have misplaced the mag i got it from! What did you serve this with? having friends for dinner and what to "impress" with little time on my hands, last time i did it with a sweet potato rosemary mash which was amazing, but quite rich! what would you suggest? Your thoughts would be greatly appreciated, and im so glad and came across your blog! Hi Nix! So sorry for the late reply! Glad this post was able to help you somewhat 🙂 We usually serve this with rice (our staple side here in the Philippines!) but this would also be good with some crusty country-style bread and a green salad on the side!